Lac Seul Floating Lodges - Hudson, Ontario: Rent 65 foot and 75 foot fully modern houseboats. Lac Seul Floating Lodges offers you a choice of several houseboat sizes to suit your needs. With 11 houseboats, we can accomodate groups of many sizes. If you desire to sit back, relax and enjoy the magnificent scenery, there are shuttle pilots (knowledgeable, independent contractors) available to take you out to the location of your choice, secure you, then come out and bring you in when required. With space for 10 to 12 guests, our modern Grandeur 75 foot and Super 75 foot Houseboats offer plenty of space for everyone. Each 75 foot houseboat has five private bedrooms (with bunk beds) as well as two hide-a-beds in the front for sleeping up to 12 people. Our standard 75 is 20 feet, 4 inches wide with an interior width of 16 feet, 4 inches. The super 75 houseboats are two feet wider. Whether you’re fishing, hunting or out exploring what Lac Seul offers, you’ll do it in comfort and style. Our 65 and Super 65 foot, modern grandeur houseboats offer space for 6 to 8 guests. Each boat has three private bedroms (with bunk beds) as well as two hide-a-beds up front for sleeping up to 8 people. Our Super 65 and regular 65 have an exterior width of 20 feet and an interior width of 16 feet. 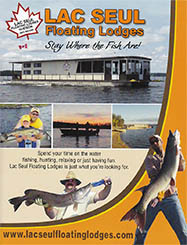 At Lac Seul floating Lodges all houseboats come with a full assortment of amenities to keep our guests comfortable on their fishing and boating adventures. All of our Houseboats come with a wide variety of included amenities, extras and standard equipment. Listed above in the houseboat details are the differences between our boats. To make your stay with us the best possible experience the following is included with every houseboat.